Pierre & Patrice, originally uploaded by johnwmacdonald. 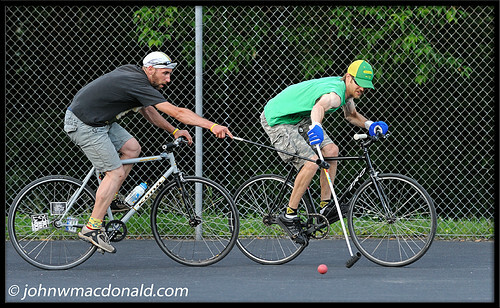 Pierre chases down Patrice in a pick up game of bicycle polo on Saturday evening. They play in the park across the street from Di Rienzo's sandwich shop on Beech Ave. in Ottawa. See you there Sunday afternoon? I am going to try and check out the game around 2pm. cool. but you should come to the dusty owl at 2pm instead. poets are a baaad influence.